SINN FÉIN have criticised the DUP for challenging a council’s decision to fly a rainbow flag from civic buildings on Pride Day. Cllr Darren McNally accused the DUP of waiting until the ‘final hour’ to challenge the decision of Armagh City, Banbridge and Craigavon (ABC) Borough Council. 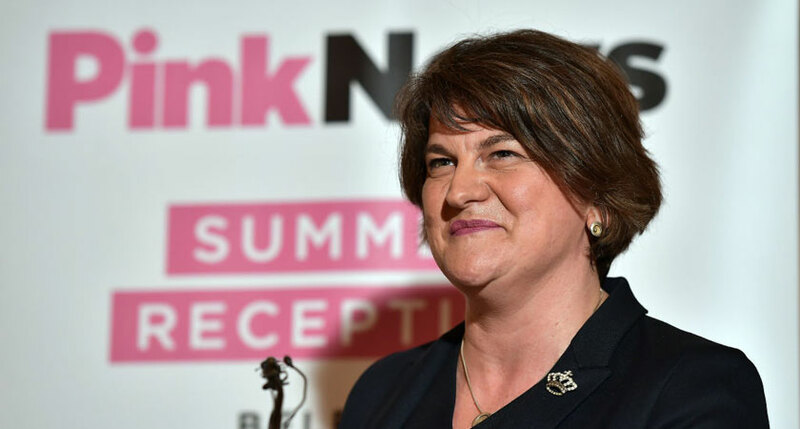 However DUP leader Arlene Foster told BBC NI’s Good Morning Ulster radio programme that the Sinn Féin motion – which was passed by the council on July 23 – was a ruse to have the union flag removed. The motion called for the rainbow flag to be flown from the Craigavon Civic Centre, Banbridge Civic Building and the Palace Demesne in Armagh this Saturday, Pride Day, in support of LGBTQ+ citizens. However the DUP waited until August 31 to use a special ‘call in’ procedure, by which a council decision can be called in for reconsideration if 15 per cent of councillors request it. The DUP is the largest party on ABC Borough Council with 13 councillors – almost 32 per cent. Sinn Féin’s Cllr McNally described the DUP’s ‘call in’ as ‘disgraceful’. “Moves by the DUP to call in Sinn Féin’s motion to fly the rainbow flag at civic buildings across the area is disgraceful and disrespectful to our LGBTQ+ community,” the said. “This call in came in the final hour – and is an effort to run down the clock on gaining legal advice and securing a special meeting of the council before Saturday. However Mrs Foster told Good Morning Ulster that the motion was a ‘ruse by republicans’. “Policy in the ABC council is only to fly the union and Armed Forces Day flags and colleagues in the council felt this was a ruse by republicans to remove our national flag and it was not about respect or pride at all,” she said. In June, Mrs Foster became the first DUP leader to attend an LGBT event in Northern Ireland.